Chiney Ogwumike, right, got her first professional win over sister Nneka Ogwumike in the Sun’s 102-94 victory over the Sparks. Photo courtesy of Connecticut Sun. 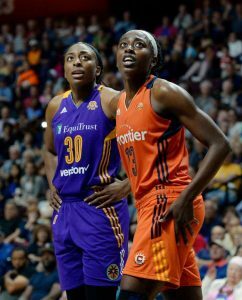 Uncasville, Conn. – The Connecticut Sun clamped down on defense and upped their offense in the fourth quarter Thursday to surge past the Los Angeles, Sparks, 102-94. 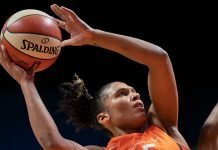 It was the second straight 100-plus point outing for the Sun – the first WNBA team in history to have such a start. Chiney Ogwumike led six Connecticut players in double figures with 18 points. 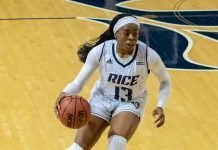 Jonquel Jones scored 17 and Alyssa Thomas, 15, in a match up that featured 17 lead changes, 16 ties, and a 37-17 fourth quarter run by the Sun, who shot 62.5 percent on the night. Both teams were in offensive rhythm, but in different ways. Through three quarters, the Sparks’ drive and dish left players completely unguarded for threes, and they hit five in the first period. After three, Los Angeles led by nine points – the largest margin by either team in the game. The Sun’s success was more on the inside, where spacing, ball movement and an ability to finish at the rim kept them in the game. They outscored the Sparks, 50-26, in the paint. Certainly part of that inside dominance was that neither All-Star Candace Parker, out with a back injury, nor Jantel Lavender, who is still overseas played. The win, however, was not necessarily because Los Angeles was short-handed. Neither of the missing posts shot 54.7 percent last year, which the Sparks shot as a team in this game. Defensively, they well could have made a difference, but Miller pointed out that this same lineup defeated Minnesota earlier in the week. The Connecticut advantage in rebounding was offset by their more numerous turnovers. Each team had 64 shot attempts. The Sun entered the fourth quarter with a nine-point deficit, but noticeably tightened up their defense and took back the lead with a 10-0 run. Los Angeles immediately came back to the lead by as many as four points midway through the period. Connecticut surged ahead for good on a series of plays led by Jones, that showed her versatility. First, she drove inside and kicked the ball to Alex Bentley on the perimeter for a three. On the next possession, she drove the ball past Nneka Ogwumike for a bucket at the rim. And on the next possession, she stepped out to the left arc for a three-pointer to give her team a four point lead. Jones scored ten of her 17 points in the final period. Thomas was everywhere in the Sun’s sprint to victory, scoring nine of her 15 points in the fourth, along with five rebounds, two steals, and a blocked shot. The Sun out-rebounded the Sparks 11-3 in the quarter. Chelsea Gray led four Los Angeles players in double figures with 21 points, while Odyssey Sims notched 20. Connecticut’s 37 points in the last frame was a team record. They appeared to have more energy than the Sparks, who played their third game in five days. 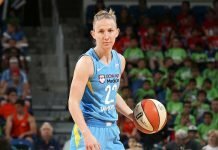 Fatigue will be a regular concern this season, where the WNBA schedule has been compressed to avoid a conflict with the FIBA World Championships in late September. The two teams meet twice more this season: July 3 in Los Angeles, and Aug. 19 back at Mohegan Sun Arena. Connecticut plays Indiana Saturday, and then has six days off before beginning a tough stretch of five games in eight days, with four on the road. The Sparks play Phoenix Sunday at home, then get a full week off after playing four games in seven days.